Caesar salads always remind me of my friend Top Gun. Well, her and my mom. My mom was introduced to chicken Caesar salads in the early ’90s, when they were ubiquitous on restaurant menus, and she loved them. In another, more accurate sense, she did not like Caesar salad at all; what she liked was lettuce with chicken and croutons. This led to lots of befuddlement amongst restaurant servers, who’d stare at my mom blankly when she’d order a Caesar salad with ranch dressing. They’d stand there a little while longer, shifting weight from foot to foot uncomfortably, until it fell to me to explain that she wanted the ranch dressing instead of the Caesar dressing. Amazingly, and to the collective credit of restaurant employees in southeastern Wisconsin in the early 1990s, no one ever pointed out (at least within earsh0t) that what she was ordering wasn’t, in any way, a Caesar salad. My mom’s home version of Caesar salad strayed even farther from the classic definition. She’d put out whatever lettuce we had in the fridge — sometimes romaine, sometimes iceberg — along with a box of croutons, a bottle of ranch dressing, some sauteed chicken breast, and a bowl of shredded cheddar cheese. Fine summer eats, sure, but again: not a Caesar. I’m not sure that I had a real, authentic, classic Caesar salad until I met Top Gun and her parents. I was living with a boyfriend after college, and Top Gun’s parents lived across the street from us; Top Gun was finishing up at the US Air Force Academy, and would come back to visit on school breaks (am I supposed to call them furloughs?). 1. Top Gun is, obviously, not her real name. My old boyfriend’s crowd nicknamed everyone. (I really thought his sister was named Hank for the first three months we were dating. When I finally got up the nerve to ask why his parents had named a baby girl Hank, he looked at me like I was crazy, and said, “Her name’s Erin.” Get it? Hank Aaron? Sure you do.) And yes, Top Gun the movie is about the Navy, not the Air Force. I told you, I didn’t make up the nicknames. 3. Top Gun’s dad makes probably the best Caesar salads in the world. I used to go over to their place for dinner a lot; I’m sure we ate other things, but I always only remember having Caesar salads and grilled steaks. (And it seems to me that there was always a fire going in the fireplace and Van Morrison playing on the stereo. Whether these memories are accurate or not, I like them.) The first time I met her dad, he asked me how I liked my Caesars; I said “stinky.” He then asked how I like my steaks; I said “bloody.” He told me I could come over for dinner anytime. Top Gun’s dad was the first person I ever watched make a Caesar salad the traditional way, in a wooden bowl reserved exclusively for that purpose. 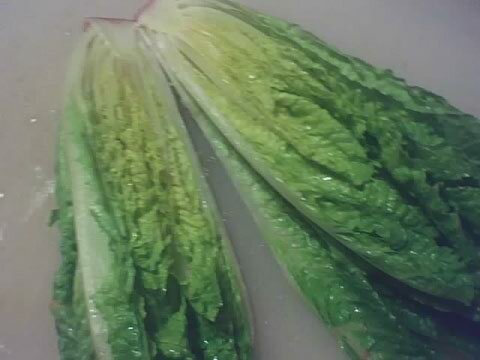 I don’t have a wooden salad bowl, but last night I was craving something stinky and salty and crunchy and refreshing, and a Caesar salad seemed to fit the bill perfectly. This recipe — as with all true Caesar dressing recipes — calls for a couple of ingredients that often cause some consternation and/or discomfort: raw egg and anchovy. 2. You’ve almostly certainly had anchovies before without knowing it, and chances are you thought they were pretty good. Ever had a Bloody Mary with a splash of Worcestershire sauce? Ever had Thai or Vietnamese food (in which fish sauce is almost always a key ingredient)? Then you’ve had anchovies. Off the soapbox; back to the recipe. In a medium-sized bowl, toss in 1/2 teaspoon salt and 1 teaspoon freshly cracked black pepper. Add one or two garlic cloves, finely minced, and use the back of a spoon to mash the garlic, salt and pepper into a paste. Add two or three anchovy fillets, and mash into the garlic paste until smooth-ish. 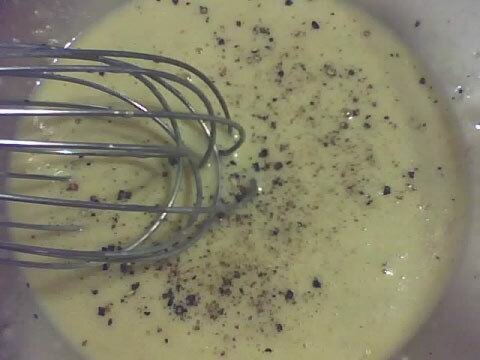 Then add about a tablespoon Dijon mustard, and smash again. 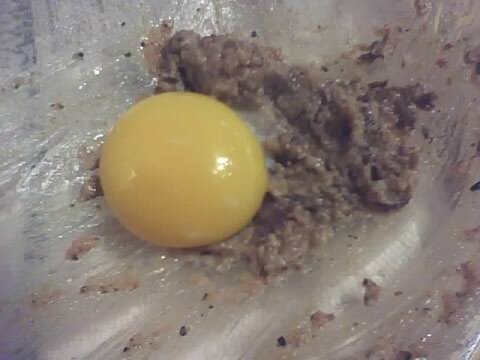 Slip the egg yolk (or the whole egg, if you prefer) into the bowl, and smash. At this point, you’ll want to switch to a whisk. Squeeze in the juice of half a lemon, and whisk to combine. Whisking constantly, trickle in a few drops of extra-virgin olive oil, then once that’s worked in, continue to pour the olive oil in a thin stream until you’ve got something of a dressing-y consistency. This’ll be anywhere from 1/3 to 1/2 cup oil, I’m guessing. Add a few more generous grindings of black pepper, then taste for seasoning. Is it too lemony? Add a bit more oil. Not salty enough? 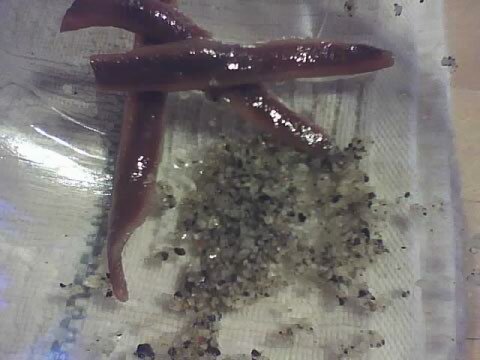 Add more salt, or another anchovy. Needs more tang? 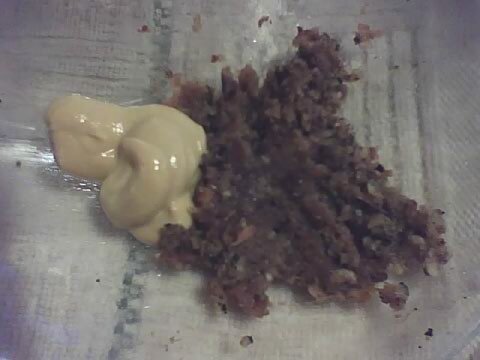 Add more mustard. And so on. and drizzle the dressing over it. 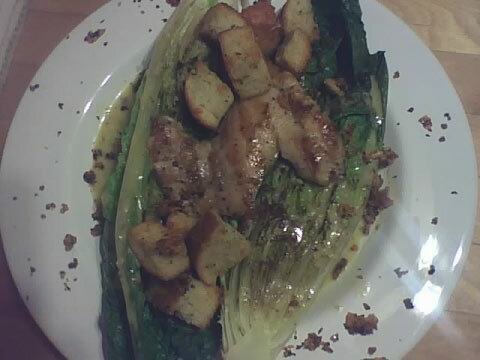 (For bonus fancy-points, you could throw the romaine halves onto the grill to char them a bit.) Add some croutons and some shaved Parmesan cheese, and garnish with some more black pepper. Oh, and I made my own croutons, which is easier than you’d think. Just chop up some herbs (I used sage, thyme and rosemary), and a clove or two of garlic; cut half a baguette into cubes, and toss everything together with some olive oil, salt, pepper, and shredded or grated Italiany cheese (I used shredded asiago, because that’s what was in my fridge, though I don’t remember buying it). Bake at 350 until golden and crunchy, about 30 to 45 minutes (a little less, if you’re using stale bread). Mine didn’t turn out so great because I forgot to spray the foil-lined baking sheet with oil. All of the garlic, herbs and cheese stuck to the foil, but I wound up peeling it off and adding it to the salad for more crunch and flavor; you can see it on the edge of the dish. Add some grilled chicken or salmon if you want a more substantial meal. Or serve it plain alongside a bloody steak. Was it as good as the salads Top Gun’s dad made for me a million years ago? No, because nothing’s ever as good as you remember it being. But it was garlicky and delicious, and I’ll be making it over and over this summer when it’s too hot to cook. Grilled Caesar’s are the best. Yum! For real! They always remind me of Nana’s. I used to love going there, sitting at the bar and eating a grilled Caesar while I waited for The Husband (then The Boyfriend, I suppose) to get done with his shift. I also will be making it alot this summer. I’ve forgotten how simple it is, and how much of that stuff I always have in my fridge. What a smart cabbage you are. Anchovies do scare people. I once pointed out to a roommate that her favorite TJ’s frozen Thai rice bowl thing had anchovies in it and instead of deciding she might like them, she stopped eating Thai food. I actually felt really bad for telling her! P.S. I love that cook with and blog about things like anchovies and mutton! Thanks for reading (and for the blogroll link)! That’s such a drag about your friend who just gave up Thai food — especially food she actually liked! That’s crazy to me. OHHHHH BUT I HAVE NO LEMONS! Citrus fruit = pretty much the reason I will never be a true locavore. Oh, and coffee.